Affiliations: 1Department of Medicine, University of Minnesota Medical School, VAMC Minneapolis, MN and 2GeneSegues, Inc., Chaska, MN. Abstract: Targeted Nanocapsules for Hepatic Cell-type and Tumor-specific In Vivo Delivery of Plasmids or Drugs. Gretchen M Unger2, Vicci Korman2, Diane Tobolt2, Betsy T Kren1*, 1Department of Medicine, University of Minnesota Medical School, Minneapolis, MN, United States and 2GeneSegues, Inc., Chaska, MN, United States. In contrast to the efficient delivery by viral vectors, the use of nonviral vectors for gene and cancer therapy has been hindered by the lack of in vivo delivery systems. While hydrodynamic push is used extensively for hepatic plasmid delivery, this method delivers DNA nonselectively to liver cell types as well as off-target sites like kidney, and heart. Moreover, many effective molecular targets for cancer are also essential for normal cells thus require tumor-specific targeting. One strategy for increasing delivery to a specific cell type is by targeting receptor(s) that are either unique or highly expressed by that cell. Hepatocytes (heps) express aisaloglycoprotein receptors (ASGPr), liver sinusoidal endothelial cells (LSECs) express hyaluronan receptors (HAr) and tumors have a high avidity receptor for a fragment of tenascin (TBG), providing ideal targets for ligand-mediated receptor uptake. 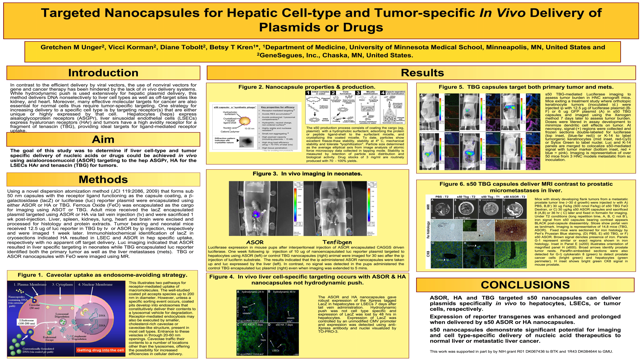 The aim of this study was to determine if liver cell-type and tumor specific delivery of nucleic acids or drugs could be achieved in vivo using asialoorosomucoid (ASOR) targeting to the hep ASGPr, HA for the LSECs HAr and TBG for tumors. Using a novel dispersion atomization method (Mol Cell Biochem 274:77, 2005) that forms sub 50 nm capsules with the receptor ligand functioning as the capsule coating, a β-galactosidase (lacZ) or luciferase (luc) reporter plasmid were encapsulated using either ASOR or HA or TBG. Adult mice received the lacZ encapsulated plasmid targeted using ASOR or HA via tail vein injection (tv) and were sacrificed 1 wk post-injection. Liver, spleen, kidneys, lung, heart and brain were excised and processed for histology and protein extracts. Tumor bearing and neonatal mice received 12.5 ug of luc reporter in TBG by tv or ASOR by ip injection, respectively and were imaged 1 week later. Immunohistochemical identification of lacZ in cryosections indicated HA resulted in LSEC and ASOR in hep specific uptake, respectively with no apparent off target delivery, which was confirmed by western blot. Luc imaging indicated that ASOR resulted in liver specific targeting in neonates while TBG encapsulated luc reporter identified both the primary tumor as well as the liver metastases (mets). Targeting the tumor using TGB encapsulated RNAi to silence expression of casein kinase 2 (CK2) resulted in elimination of the liver mets and significant or complete regression of the primary flank tumors. In conclusion, ASOR, HA and TBG targeted nanocapsules can deliver plasmids in vivo to heps, LSECs, or tumor cells respectively. TBG RNAi oligonucleotides directed against CK2, effectively cleared liver mets as well as reducing or eliminating the primary tumor.